A while back, I wrote two posts that discuss Link Aggregation Groups (LAGs) from a positive and negative angle. The idea is that LAGs offer some benefits and drawbacks, and the ultimate decision to choose one over the other should be driven by requirements for the environment. A few folks have asked some questions around mixing LAGs with various vSphere binding techniques. Specifically, iSCSI Port Binding and Multi-NIC vMotion. I think it’s important to point out that LAGs and binding techniques are both looking to control and distribute traffic but in very different ways. It would make no logical sense to combine them, and many bad things can (and most likely will) occur if you do. Also, it’s not supported. The upstream switch can also send traffic to the host across whichever physical interface the hashing algorithm it has chosen. Conversely, port binding forms a 1:1 relationship between a logical entity, such as a VMkernel port, and the physical uplink. The traffic is not inspected and no choices are made dynamically – you configure the relationship once and it is respected until you make a change. Below is an example. Two VMkernel ports, vmk1 and vmk2, are attached to their own Port Groups named PG1 and PG2, respectively. PG1 is configured to Actively use Uplink1 and not Uplink2. PG2 is configured the opposite way. Thus, vmk1 can only use Uplink1, and vmk2 can only use Uplink2. If a failure occurs on either Uplink1 or Uplink2, the associated Port Group and VMkernel port are also rendered offline. The idea behind binding is to create logical fabrics. iSCSI now knows it has two distinct paths out of the hypervisor by way of vmk1 and vmk2. Depending on what multipath IO (MPIO) protocol was chosen, iSCSI might favor one over the other, or use both at the same time. But we leave those decisions up to the MPIO engine, not the network itself. Let’s imagine you somehow circumvented all of the logical checks that prevent you from combining port binding with a LAG. Based on the traffic headers, the LAG may decide to place traffic from both VMkernel ports onto Uplink2, leaving Uplink1 all by his lonesome self. That’s because a LAG acts like a logical interface, and thus the VMkernel ports would both think they are talking to a single logical port. And as you can see, this combination defeats the purpose of binding and adds two control mechanisms to the traffic flow. Note that we’re only talking about the host interfaces (uplinks) in this scenario, not the storage facing ports. Those can, and often are, configured as a LAG to distribute a many:few quantity of sessions (many hosts to few storage ports). A similar situation is encountered when doing this with Multi-NIC vMotion, except that configuration uses Active / Standby for the Port Groups instead of Active / Unused. Still, we don’t want a LAG getting in the way of discrete uplink selection that is driven by the hypervisor. So if fan is a synonym for a nut. And I like your blog. Does that make me a Wahl Nut? Thanks for writing this article, this helps clarify a lot of questions that I had in mind. 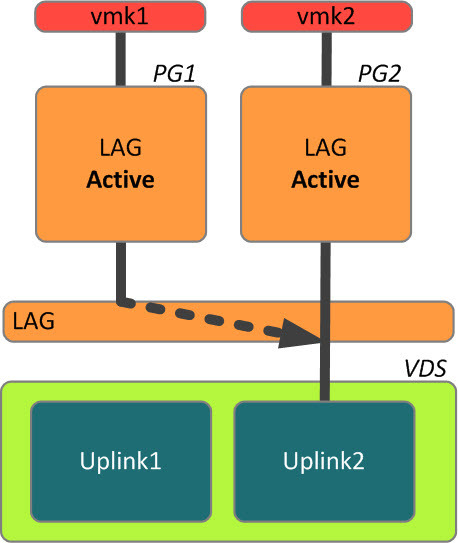 Just want to clarify one more thing, based on the above article and traffic flow diagram, are we saying that even if we set the uplinks in the PortGroup under DvSwitch (with LACP) to Active/Unused, there is no guarantee that LACP will honor that settings? i.e., traffic may still flow to the ‘Unused Uplink’ that is logically bound to a physical nic? LACP becomes a single logical uplink in 5.5 and beyond. You would choose the LACP interface itself, rather than having the ability to select an individual uplink. The LACP interface is responsible for choosing the physical uplink. What about in vSphere 5.1, where there are options to configure uplinks to be in active/unused, or active/standby? Would dvSwitch+LACP honor that? Perhaps. But the return traffic path would be variable due to the nature of the hashing algorithm. Meaning that traffic could leave the host on Uplink1, but the return traffic could select Uplink2. It’s simply not feasible to combine a hashing algorithm with explicit uplink selection and expect reliable and predictable traffic flows. Interestingly though, did a mock test (will need further analysis and confirmation), even making uplinks in the portgroup active/unused, traffic does still go through the physical link that was supposedly bound to the ‘unused’ uplink in portgroup. As I mentioned, I will need to re-test and confirm again in a more isolated environment to be 100% certain. – Is there a good reason to still have multipath configured this way, instead of having one iSCSI VMkernel (if we were to use a single subnet on ESXi and Target storage). In this case there’s no routing table to be addressed through interfaces binding for Software adapter, where the path is still going to be redundant, just offloaded to the networking layer, instead of being addressed by hypervisor. Any known issues with this scenario? Others have tried the non-supported configuration; it often works, but not properly due to the failed attempts for the initiator(s) to log in. I wouldn’t recommend it. Thanks, Chris. Not sure why it wouldn’t be supported, or at least I cannot find any references to this type of config not being supported, hopefully someone can point me to the right source. Option 1: ESXi configured with 2 x vmk’s for iSCSI, no port-binding used, each vmk for iSCSI uses its own subnet to reach out to the iSCSI storage target. The only 2 x 10G’s on the system form LAG, selected for vmk’s in their respective portgroups policy. Single VMK for iSCSI. No Port-binding required; redundancy achieved on the networking level. I’m wondering which one of these two options would be the one non-supported or where the initiators login issues were discovered. Like the article states, the support issue arises when you try to use multiple subnets with VMkernel binding due to all initiators not being able to log into all targets (without routing). This is specific to VMkernel binding. It’s perfectly fine to use multiple subnets for non VMkernel binding scenarios. Refer to your vendor’s configuration recommendations for more detailed specifics.